The image at left shows Mystery racing in the Royal Port Nicholson Yacht Club Commodore trophy race in 2012. Mystery is of the Idle Along class native to Wellington. She was built by the most successful builder of IAs, Joffre Kroening, about 1950 in Nelson. 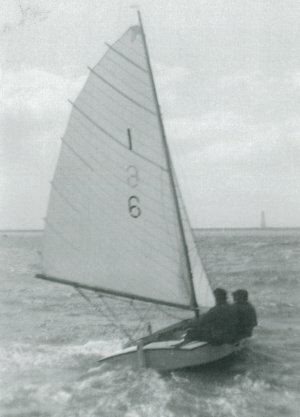 Representing Nelson, she came second in the Moffatt Cup in 1956, finishing behind Hugh Poole of Wellington who was also sailing one of Kroening's boats. 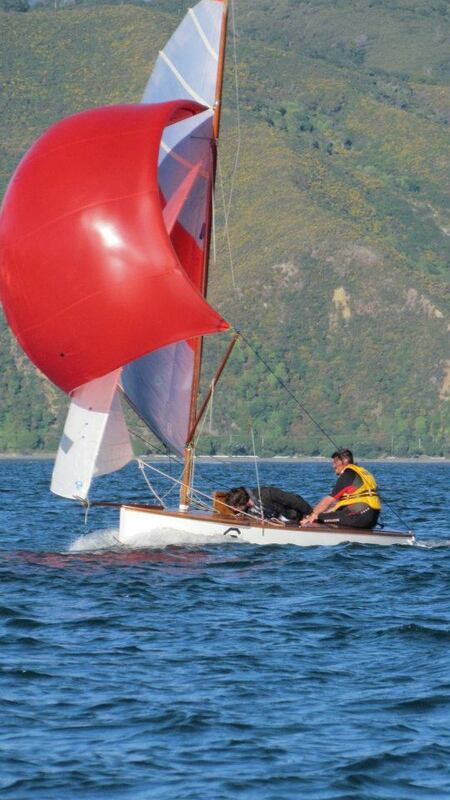 She was restored by the Wellington Classic Yacht Trust in 2011/2012, and raced in the 2012 North Island and National championships in Auckland where she finished 2nd and 6th respectively, against much newer and lighter boats. She has a kaikawaka hull, cedar deck, and douglas fir spars. Below is a brief story of the class. The Idle Along is the only Wellington design to become a National Class for New Zealand. It was designed by Alf “Unc” Harvey in 1927, the first one completed at his home at 20 Aurora Tce Petone in 1930. His inspiration and ideas were rather unorthodox, though the end result answered some practical problems for Wellington class racing. 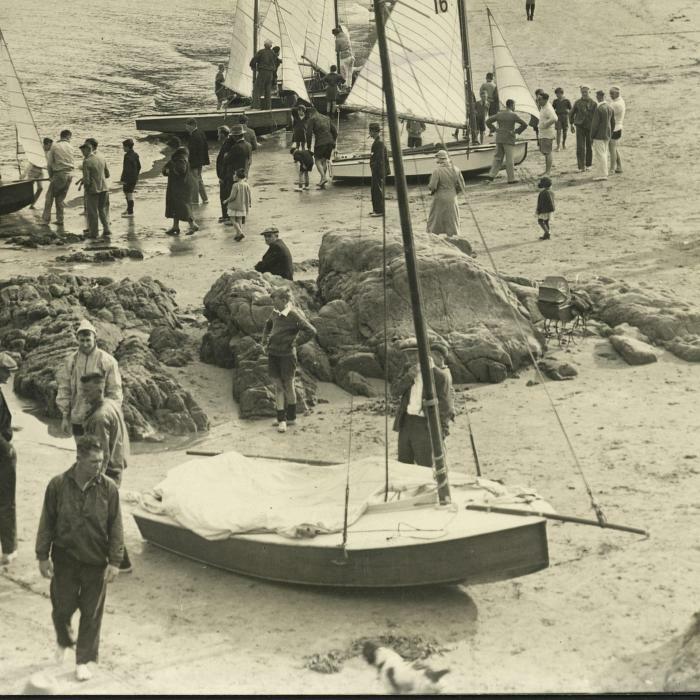 Wellington had had several centreboard fleets and sailing clubs come and go, though these never really got off the ground - professional boatbuilders like Joe Jukes and Ted Bailey reigned supreme during the early part of the 20th century, and their boats almost invariably won. A cheap one-design class, easily built by amateurs was needed, and Alf Harvey provided the answer. Harvey sought stability and speed, and found it in nature - a 12 foot, 8 inch porpoise in fact, which he captured, measured, and released in Worser Bay. The curve of the porpoise’s back inspired the keel profile, the back fin the centre plate, and the tail the rudder. These lines can clearly be seen in the boats' profile. In section however, it is a different story! The design had a very large beam for the time - at 6 feet, almost half the length, it gave the boat stability. Airtight sections fore and aft lent extra buoyancy. The chined hull made it reasonably simple for amateurs to build and race their own vessels. In the early days the Idle Along was scorned by most in the sailing fraternity; nicknamed butterboxes (in Wellington they were built from Kahikitea, and they had rather square sections) or at times aircraft carriers. This was until a famous day of racing in a typically blustery Wellington Northerly during the 1933/34 season. All racing was cancelled, but that didn’t stop the small Idle Along fleet racing. People paid attention, and respect. The first inter-province championship for the class (for the Moffat cup) took place in Wellington in 1936, which was won by Tauranga. The last one was raced in 1969 in New Plymouth and won by Taranaki. 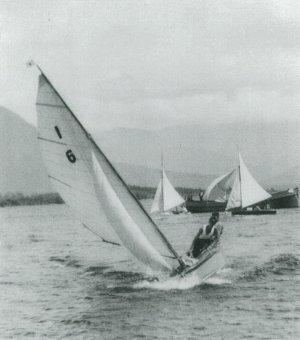 John Spencer designed a plywood version for the Association in 1960, but by then the class was already suffering a decline due to interest in the Olympic classes, and the successes that NZ Olympians were having - thanks in a large part to the techniques and skills they learned sailing Idle Alongs as youngsters. The class has recently revived, and the national trophy competed for in2010. The 2011 competition was held at the Bay of Islands, and Auckland in 2012. More information on the Class Association can be found here. The plans were amended at various times, most notably by John Spencer who created a plywood version in 1960, which can be viewed here. In 1951 an official plan, set of offsets, etc were drawn by A. M. Fitton for the Wellington Provincial Yacht and Motor Boat Association. A pdf of them can be viewed here. The Wellington Classic Yacht Trust has a copy of an revised set of plans drawn by Harvey in 1940, but we haven't scanned them yet. The original plan can be viewed hanging on the wall of the Heretaunga Boating Club.